V-Secretaries Conference Y. M. C. A.
VII—Mountain Lake Park Camp Meeting. VIII—Mountain Lake Park Bible Conference. IX—Women's Home Missionary Society Convention. XII—Convention of the Archery Association of North America. These programs took up the entire day, including evening—from July 1st to Labor Day. 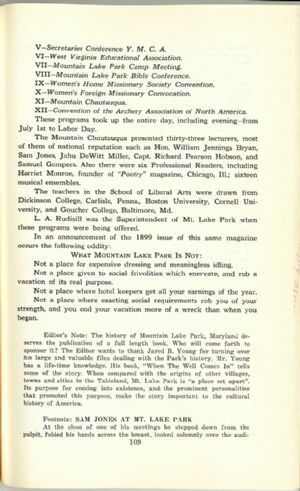 The Mountain Chautauqua presented thirty-three lecturers, most of them of national reputation such as Hon. William Jennings Bryan, Sam Jones, Jahu DeWitt Miller, Capt Richard Pearson Hobson, and Samuel Gompers. Also there were six Professional Readers, including Harriet Monroe, founder of "Poetry" magazine, Chicago, Ill.; sixteen musical ensembles. The teachers in the School of Liberal Arts were drawn from Dickinson College, Carlisle, Penna., Boston University, Cornell University, and Goucher College, Baltimore, Md. L. A. Rudisill was the Superintendent of Mt. Lake Park when these programs were being offered. Not a place for expensive dressing and meaningless idling. Not a place given to social frivolities which enervate, and rob a vacation of its real purpose. Not a place where hotel keepers get all your earnings of the year. Not a place where exacting social requirements rob you of your strength, and you end your vacation more of a wreck than when you began. Editor's Note: The history of Mountain Lake Park, Maryland deserves the publication of a full length book. Who will come forth to sponsor it? The Editor wants to thank Jared B. Young for turning over his large and valuable files dealing with the Park's history. Mr. Young has a life-time knowledge. His book, "When The Well Comes In" tells some of the story. When compared with the origins of other villages, towns and cities in the Tableland, Mt. Lake Park is "a place set apart". Its purpose for coming into existence, and the prominent personalities that promoted this purpose, make the story important to the cultural history of America.